Since the group formed in 2013 we have employed a total of 38 construction apprentices. Our apprenticeships are created to build a work force and create a better future for our neighborhood, providing opportunities for the young people of M22 and M23. Over the last 12 months we have had 9 apprentices move into full time permanent employment 6 of which secured positions as full time trades people within WCHG, covering a range of trades from plastering, joinery and gas servicing. We offer an apprenticeship that not only provides a trade qualification it provides work experience in a real environment learning vital skills for a successful career. 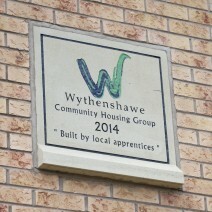 In 2014 WCHG Apprentices successfully built 6 bungalows the first project of its kind in Wythenshawe. Our apprenticeships are restricted to those living in the M22/M23 postal area, recruitment usually takes place during the summer months and will be advertised through the local schools and colleges. Q. I live outside the Wythenshawe area can I apply for an apprenticeship ? A. As a not for profit landlord we are dedicated to reinvesting in the local area and community, we do this by ring fencing apprenticeship opportunities to those in the local area. The National Apprenticeship Service lists thousands of apprenticeship opportunities both locally and nationally, visit their website for more information. www.apprenticeships.gov.uk. Wythenshawe Community Housing Group are just one social landlord operation in Manchester, you could look at other housing organisations and local authorities for apprenticeship opportunities. Q. How long is an apprenticeship for ? Q. Am I guaranteed a job at the end of the apprenticeship ? A. There are no guarantees at the end of the apprenticeship of full time work however any suitable positions at the time will be made available to apprentices. All apprentices will be given help and support during and after their apprenticeship to ensure they are in the best position to secure employment be that with the group or outside.